In a media conference call, Maeda and Ryan chatted about the show, getting gory, and how co-star Hiro Sanadagore really is their hero. Q: “The X-Files” was very dark like “Helix” but had at least a little humor in the interplay between Scully and Mulder. But “Helix” is just relentless. Do you plan to keep up this intensity or are you going to let us breathe every now and then somewhere in the series? Steve Maeda: No. We want to keep up the intensity. There are light moments coming, but … it’s black humor definitely, and they tend to be in service of keeping everything moving and just sometimes you find those moments, you know, in the worst situations. So yes, we have 13 episodes and … our mantra was to keep the show moving. And so we want to have down time, we want to have character time, but we definitely want to keep everything twisting and turning and keep you coming back for more hopefully. Q: What first attracted you to this role, Jeri? 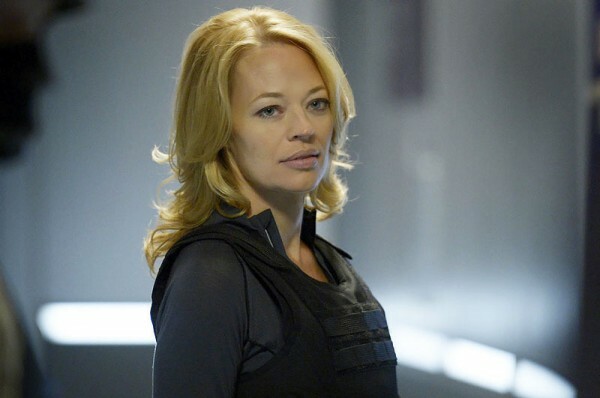 Jeri Ryan: You know, it was fun. Well, the concept of the show to begin with was sort of intriguing to me. I hadn’t seen any of it at that point because it was just being shot. And, I loved the people that were involved in it. So that was all really cool … This is my first foray back into sci-fi in a number of years, so it was nice. It was a lot of fun to get back into it. Q: What was it like to work on a series that’s sometimes kind of gory and gross? Q: You got to kind of get rough with Hatake [Hiroyuki Sanada] when you get mad at him. How fun was that? Jeri Ryan: Yes, it’s a lot of fun. I always enjoy those scenes. But … I have to tell you, I have to brag about Hiro for a minute. That man is unbelievable. I was in awe of him. I still am in awe of him. The man is a ninja … The scene where I had to throw the book at his head, and I have to throw it directly at his face … I can’t, like, pretend to throw it. I have to wail it at him and he’s standing like six feet away from me. And I was a wreck shooting the scene. I was so nervous. I was like, “Dude, I have no aim. I can’t.” He was like, “Just throw it. Just do it. Just right at my face. Just go.” And there’s cameras set up right behind him, and so he has to knock the book away, and we’re worried about hitting the lens and all this expensive equipment. He never even blinked. Never flinched. Never breathed heavy. Nothing. Every take, he just batted it out of the way like it was nothing in the exact spot that it was supposed to land so it didn’t hit any equipment. He is amazing. He is amazing. Steve Maeda: He pretty much didn’t flinch for the entire series. Q: So he really is a badass and plays one on TV? Q: How do you feel about the fan reaction that you’re getting in social media and online? Steve Maeda: Oh, I think it’s marvelous. This is the first show I’ve worked on where [we’ve] had that kind of reaction. I was on “Lost” for a season and Twitter was a lot more in its birth stages, so it’s really gratifying. It’s really nice. It’s almost like I tend to watch Twitter while the show’s on. And it’s really interesting to see — it’s almost like a live audience type of reaction. It’s like a 30-second delay for the tweets to hit, but it’s really cool and you get to play along and you see what people like and what they don’t like, and it’s been really fun and interesting. Ryan makes her debut on “Helix” this Friday, February 14 on Syfy.